Jay and Katie Barber combine their names to write under the pen name, J. K. Barber. The couple lives in Roswell, GA with their children, Maya and Gabe, as well as their four rescue cats. Jay graduated from The University of Georgia with a degree in English literature, and Katie graduated from The University of Colorado at Boulder with a degree in English creative writing. They combine their educations, writing together as a co-author team, for projects such as the "Chronicles of Aronshae" and "Mervidia." In addition to their collaborative work, Jay and Katie also have individual titles: "Hidden Path," a prequel to their trilogy written by Jay, and "Fallen," a post-apocalyptic angel novel written by Katie. The Barbers enjoy being parents, table top gaming, reading, mixed martial arts, riding motorcycles, and playing MMO games such as World of Warcraft. Jay and Katie Barber’s "Spellbound" is sword and sorcery at its finest. Set in the world Aronshae, where an evil sorceress leads a host of ice orcs against the outpost city of Snowhaven, "Spellbound" follows the intertwined destinies of the twins Katya and Sasha, the lonely outdoors man Jared and a delightful cast of protagonists as they desperately try to thwart the Ice Empress’s plans. Things become even more complicated when an all-powerful being decides to take a divine hand in the war for Aronshae. It has been a while since I have read a fantasy novel as enjoyable as "Spellbound". The “kingdom against an overwhelming horde led by a powerful evil magician” trope has been milked for decades in this genre but "Spellbound" manages to show how well-thought-out characters, with their own unique sets of talents and personalities can make an otherwise simple plot into a beautiful mosaic of interwoven fates. It is these characters that are the driving force of the Barbers’ novel. I love how these characters’ personalities are molded by their previous circumstances, and how they grow and adapt when thrust into new ones. The writing is well-balanced, with the dialogue engaging and detailed yet not approaching that particular point of tediousness. I squealed in delight as potions and herbs made a particularly strong presence in the story. That and the delightful new breed of magical creatures were little nuggets I appreciated. The Barbers have a way of ensuring that the pace is sustained, even with brief bursts of frenetic action contrasted with moments of character introspection. Of particular note are the fight scenes. The moves, expressions and sequences are so lovingly choreographed and detailed that I found myself actually imagining how I would react if I were facing off against a mean, bulky grappler. Suffice it to say, Jared fared far better in the book than I did in my imagination. 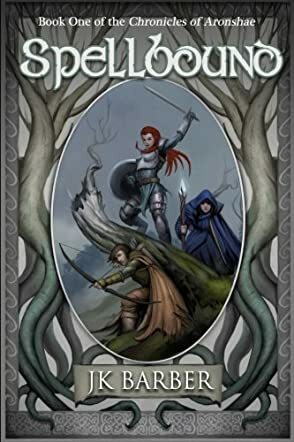 "Spellbound" is a wonderful new book, one that I would happily recommend to fellow fantasy escapists to read. With the satisfying, yet obvious “set up for a sequel” ending, I find myself eagerly awaiting the next book in the Barbers’ Aronshae series.